Jonathan to inaugurate Ekiti flyover tomorrow – Royal Times of Nigeria. Former President Goodluck Jonathan will be in Ekiti state on Wednesday to commission the first flyover in the state which was constructed by Ayo Fayose’s administration. 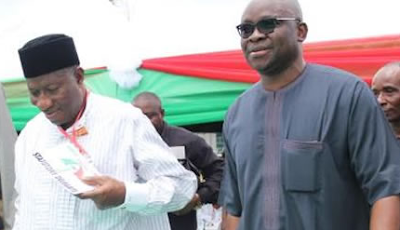 Fayose gave the hint on Monday when okada (motorcycle) riders drawn from the 16 local governments’ areas stormed Ado Ekiti, the state capital, for a solidarity rally to drum support for the governorship ambition of his deputy, Professor Kolapo Olusola. While addressing the okada riders, Fayose called on Nigerian youths to vote for only those who share their believes, aspirations and concerns and vote out the President who believe they are good-for-nothing and lazy as President in 2019 election. He then dropped the hint that Jonathan would be in the state tomorrow.